Women in Ireland have a 1 in 10 chance, on average, of developing breast cancer in their lifetime. Women with one or two close relatives affected with breast cancer have a lifetime risk of 17–30%, depending on the specific family history. Women who have a BRCA1 gene mutation have a 60–90% lifetime risk and women who have a BRCA2 gene mutation have a 45–85% lifetime risk. Women with BRCA mutations have an increased risk of developing breast cancer at a younger age. Women carrying a BRCA mutation who have been diagnosed with breast cancer have a higher risk of developing another new breast cancer. 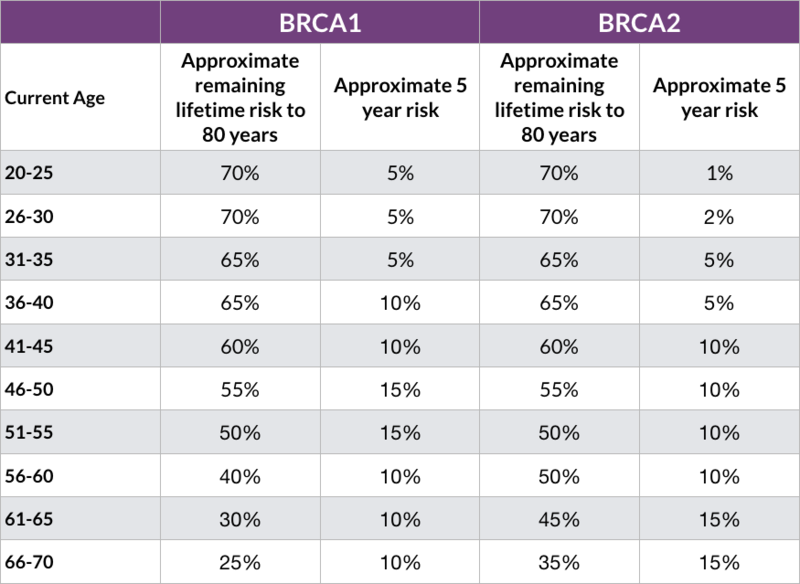 The table below shows the risk of different cancers for carriers of BRCA1 and BRCA2 mutations. Women who carry the BRCA1 mutation have a greater risk of developing breast cancer before they reach 40 years of age when compared to women carrying the BRCA2 mutation. In women over the age of 55 years it is the women who carry the BRCA2 mutation who remain at higher risk of developing breast cancer whereas women carrying the BRCA1 mutation have a lesser risk. How can I manage my risk of developing breast cancer? There are other factors in addition to genetic mutations that impact on the risk of developing cancer. The choices you make may increase or decrease your risk of breast cancer but will also impact on the options for risk reducing surgery and your ability to make a good recovery. Having your first child at a young age and breast feeding your babies reduces the risk of breast cancer. The combined oral contraceptive pill may increase the risk of breast cancer slightly but the fact that it reduces the risk of ovarian cancer is more important for women who carry BRCA mutations. It is important to maintain a healthy weight and take regular exercise which will reduce the risk of cancer but also means that you will be more likely to recover well from surgery. Drinking excessive amounts of alcohol, especially in your teens and twenties, may also increase your risk of breast cancer. Smoking will not increase the risk of breast cancer but is a major risk factor for other forms of cancer. If you are a smoker there may be some forms of breast reconstruction that would not be suitable due to higher risks of post-operative complications with delayed wound healing and loss of implants. Hormone Replacement Therapy (HRT): there are two types of HRT prescribed to relieve menopausal symptoms. Oestrogen only HRT is suitable for women who have had a hysterectomy and is not associated with any increased risk of breast cancer. Combined HRT, which contains both oestrogen and progesterone, does increase the risk of breast cancer. The risk increases with the duration of treatment and becomes more important if HRT is taken for more than five years. The risk of breast cancer reduces once HRT is stopped. Women carrying BRCA mutations are advised to have their ovaries removed and will be advised to take HRT until they are 50 years old. Taking HRT up until age 50 after the ovaries have been removed does not increase the risk of breast cancer.